According to the National Gay and Lesbian Task Force, about 20% of LGBTQ faculty members and students reported they feared for their physical safety on campus, while 43% consider their campus climate to be homophobic. These numbers demonstrate the need for colleges to take an active stance against LGBTQ harassment and discrimination ― a stance that, in part, will make it so that LGBTQ students feel safe and welcome to attend. LGBTQ is not a comprehensive acronym. Students looking for resources will likely come across many other abbreviations, since gender and sexuality fall across spectrums rather than set categories. Other examples include pansexual (P), gender non-conforming (GNC), and queer (Q). Acronyms aside, most LGBTQ campus resources try to serve as an umbrella resource for many identities. 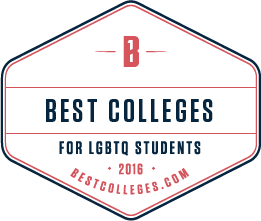 This list examines colleges that provide an exceptional level of support for students of various gender and sexual identities. We have referred to the Campus Pride index, which is a comprehensive national rating system that measures LGBTQ-friendly campus life. Campus Pride takes an exhaustive and multifaceted measurement approach, considering eight LGBTQ-inclusive factors to reach a measurement. The listing also includes descriptions of unique campus resources that provide support to students of various gender and sexual identities. Academic institutions continue to take steps to create environments and policies that meet the needs of students with a wide range of gender and sexual identities. These populations have historically been underserved by hegemonic culture, so many college administrations are spearheading efforts to raise awareness of Lesbian Gay Bisexual Transgender and Queer (LGBTQ) identities.